DEADLIEST CATCH - THE EXPERIENCE - Hello! 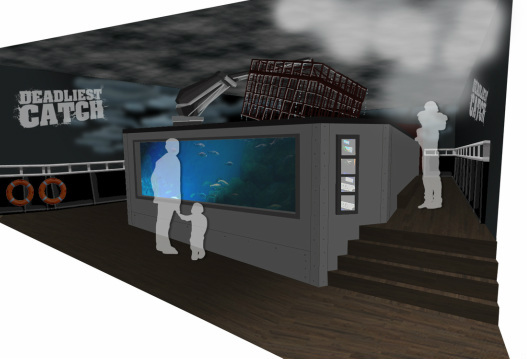 Sea Life's Deadliest Catch – The Experience brings the Discovery Channel show to life. This attraction consists of a preshow and the main tank where you really feel the drama of the Deadliest Catch. Hello! designed the attraction around existing tanks and succeeded in delivering an exciting experience for all ages. The brand of the Deadliest Catch is projected on the walls and shown on monitors in the pre-show. Water, mist and thunder and lightning effects give the sensation of being on the deck of one of their ships and actually participating in the experience of the Deadliest Catch.